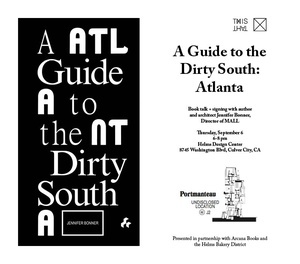 Join Jennifer Bonner (@jbonn90057 ), Director of MALL and THIS X THAT (@thisbythat ) on Thursday, September 6 for the LA book launch of “A Guide to the Dirty South - Atlanta” at Helms Design Center (8745 Washington Blvd). Presented in partnership with @HelmsBakeryDistrict We will be offering the book for sale at the event tomorrow (and in the shop after tomorrow). “Drawing on the format of the urban guidebook, Jennifer Bonner’s A Guide to the Dirty South―Atlanta generates a new discourse about the architecture of the American South. By guiding readers on a tour of Atlanta, this project seeks to reclaim a regional identity for cities otherwise deemed to be a "backwoods" by the East and West Coasts. Borrowing from the hip hop industry and recognising the rivalry between the two coasts, A Guide to the Dirty South―Atlanta acknowledges that amidst the NYC-LA rivalry, the South had its own story to tell, and redirects our attention to a ‘third coast’. Authored by Jennifer Bonner, director of architecture studio MALL, A Guide to the Dirty South―Atlanta takes the reader on a tour of “Rap City”, “Pop up Surface Lots”, “Architecture of Quarantine” and a “Geography of Smells”. Wittily designed, and featuring beautiful illustrations throughout, A Guide to the Dirty South―Atlanta is perfect for those new to the architectural delights of Atlanta and long-time fans alike."